Realme has made it official about its plans to introduce the new ‘U’ series smartphone in the near future. Following the exclusive report of 91mobiles, the company confirmed the news on Twitter via its official channel – @realmemobiles. Realme also revealed the details about the chipset that this new U-series phone will pack. The handset will be the industry’s first commercial smartphone to rock MediaTek’s Helio P70 SoC. Other specifications of the Realme U-series phone are not known yet. However, speculations are that it could be a selfie-centric device that will take on the likes of Xiaomi Redmi Y2. The handset is expected to be a mid-range phone priced in the 10k-15k segment. 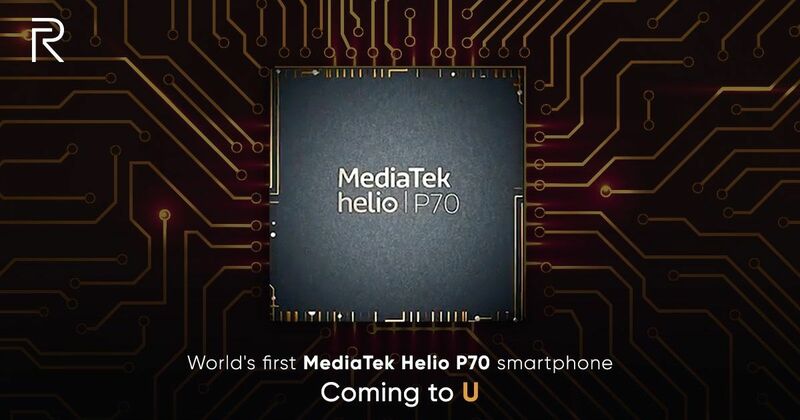 The Helio P70 mobile platform comes as a successor to the MediaTek’s Helio P60 silicon. The new P70 is an octa-core chipset with four ARM Cortex-A73 cores clocked at 2.1GHz and four ARM Cortex-A53 power-efficient cores clocked at 2.0GHz. The chipset uses TSMC 12nm FinFET process and comes with ARM Mali-G72 MP3 GPU clocked at up to 900MHz. The SoC is touted to offer 13 percent performance improvement compared to its predecessor. For photography, the MediaTek Helio P70 is said to support a super-sized 32MP single shooter or dual 24MP + 16MP cameras. The SoC employs three ISPs (image signal processing) on board that can reduce power consumption by 18 percent as compared to the previous-gen Helio P60 chipset. Other features of the Helio P70 include high-resolution depth engine that delivers a 3X boost in depth-mapping performance and real-time HDR capture support.